I really love this all black look I posted on Instagram, and it’s pretty much my go-to outfit at the moment. It’s fashionable, comfy, easy to pull together with a hint of fashion. I usually pair it with an oversized coat and if the weather gets warmer, swap my black jumper for a white tee-shirt. Voilà, job done! Isn’t this Bada Boum jumper (1) by Bella Freud fab!? I totally love its spirit. I also love this turtleneck sweater found on Mango, more formal but it feels warm and I love the cut. I haven’t worn a turtleneck for years but it has been so wet these days that I just want to feel warm every time I step outside of the house. Loving this constellation pendant (2) or this star pendant from Hush too which make gorgeous little presents. 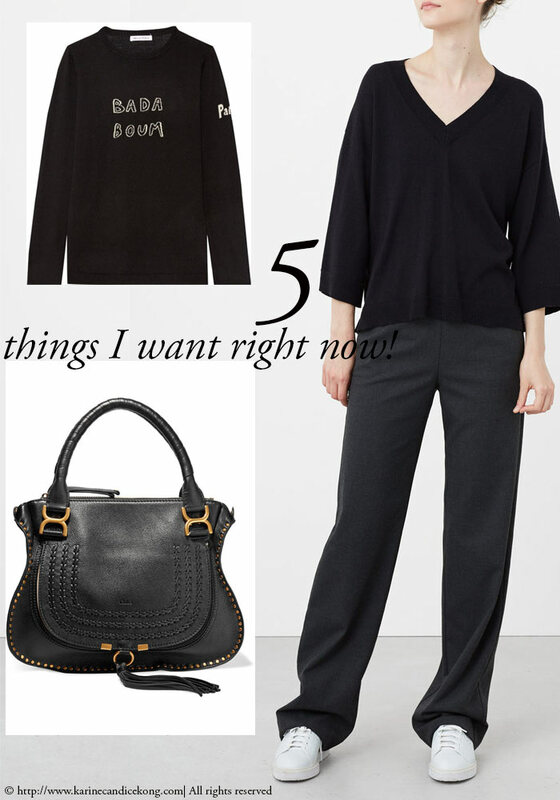 These black trousers (3) look stylish and comfy and are less than £50. I’m still longing for this Marcie bag (4) by Chloé, not that I need another bag but I love it very much and Xmas is around the corner…and finally a pair of Stan Smith or Veja. I wish you all a very nice weekend and for those living in UK, tomorrow I will post a fab competition on Instagram, which you will not want to miss! !